Don’t think it came out to bad, it’s hanging to dry now. This is an older buck I killed years ago. Someone told me how to do it this weekend and it seemed to easy not to try. Don’t know how long the paint job will last but I can always repaint it. buckcrazy wrote: Don’t think it came out to bad, it’s hanging to dry now. This is an older buck I killed years ago. Someone told me how to do it this weekend and it seemed to easy not to try. Don’t know how long the paint job will last but I can always repaint it. The last good buck I killed I has skull mounted. The guy did a great job, but I find I just don't like a skull mount. I wonder if I would like it better dipped or painted. is it as easy as they make it out to be ? 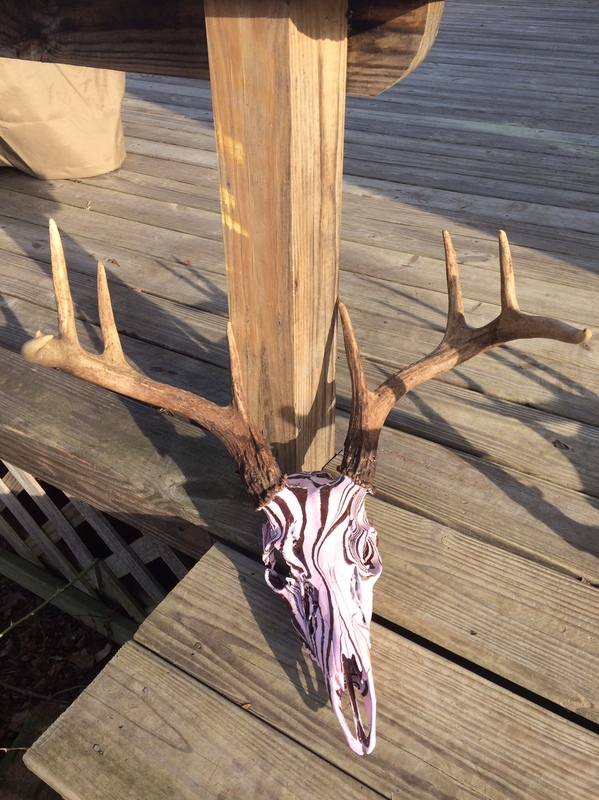 Tape the horns with painters tape, spray the skull with a base color, any color you want. Let it dry of course. Take a bucket or container big enough to submerge the skull and fill with water. Then take ENAMEL spray paint in either flat or gloss and spray the surface of the water. It will make rings of the color. Spray in the middle to push the other color out the way. Alternate colors until you like the color patterns. Take a stick and make the swirls pattern to your liking and then SLOWLY dip the skull in. While the skull is under swish the water around from the surface so it doesn't get on the painted skull when taking it out. Hang it up to dry. I did this one in 5 minutes and that includes filling the bucket with water. Its super simple!! Check them out on youtube, that's where I got the idea from. I did these two that I killed last year. Very easy. Yours looks great. It’s fun to me.